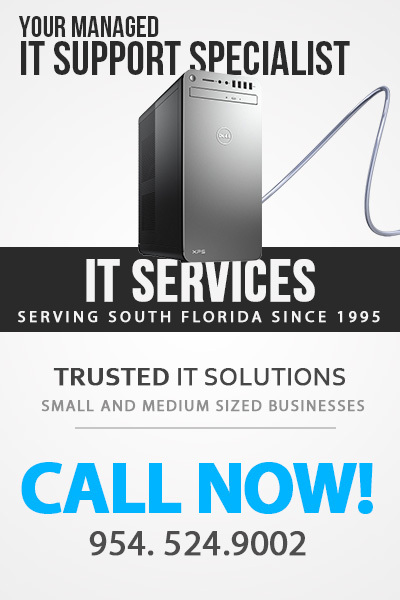 Downtown Computer offers affordable solutions and managed IT services to small and medium-sized enterprises in Florida. We cover all of South Florida! The network is the base of your business activity, that is why it is necessary to keep your network infrastructure in perfect condition. Downtown Computer offers Florida-based small and medium-sized businesses a full range of top quality managed network services. No more need to keep an expensive in-house IT department! ​What are the advantages of outsourcing your Business IT Services? 1. Cost - you can expect roughly 60% savings. 2. Streamlined services - you never have to worry about issues being resolved quickly and efficiently. ​3. Unmatched Expertise - skill and experience cannot be replaced. Your business is at stake. Downtown Computer provides 24/7 remote monitoring of your network, servers and workstations. We detect and eliminate problems before they cause any major failure. We offer reliable and effective remote support through an easy-to-use software solution. Send us a request, and we will quickly fix your problem in a live support session. We remotely update your security solutions to keep your network protected from any cyber threats. Your critical business data can be accidentally deleted, damaged beyond repair, or simply lost due to human factor or natural disasters. Our automatic backup service keeps important data safe and easily accessible in case of need. Most businesses use the conventional break-fix model: first, something breaks down, and after that support engineers come and fix it. We offer a more beneficial model, which significantly reduces downtime: we constantly monitor your servers and workstations, proactively settling issues before they cause major failures. Hidden security breaches can be fatal for your business and is reputation. We eliminate vulnerabilities and minimize the risk of malware attack and sensitive data theft. Firewall protects your network from malware/spyware and unauthorized access. We offer you managed firewall services that include firewall installation, configuration and maintenance. A virtual private network (VPN) enables your employees to access the office network via the Internet without compromising security. It can be also used to securely connect multiple networks, if you have a chain of offices. Do you need a secure way to share confidential files, legal documents, account information and other sensitive data? We offer a software solution that provides a convenient and secure data access. Many Florida-based organizations fall under HIPAA or ALTA Best Practices compliance (health care sector, mortgage companies, title companies, financial sector). If you must perform the required risk assessments but do not have enough personnel or expertise, we are at your service. We analyze your current business environment, assess all potential risk and provide a comprehensive business continuity plan that will help you sustain operations during all kinds of emergencies and successfully recover afterwards.